Use your phone as a debit card. When your phone and debit card join forces, you get one powerful tool: mobile wallet. It’s easy to do and makes for a much smoother way to pay. Just load your debit card information into your phone (or whatever mobile device you prefer to carry around with you) and now your device doubles as that card. Enjoy a seamless buying experience at eligible merchants. Get the same rewards, benefits and protections of your First United debit card. Set it up easily and leave your cards at home. You already have your phone in hand. Show it at the checkout reader to make purchases. See below for more on how to set yourself up! Hold your compatible iPhone®, iPad® or Apple Watch® near the checkout reader to make in-store purchases. You can also use Apple Pay to make in-app purchases. Simply unlock your compatible Android phone, place it near the checkout reader and tap to make in-store purchases. 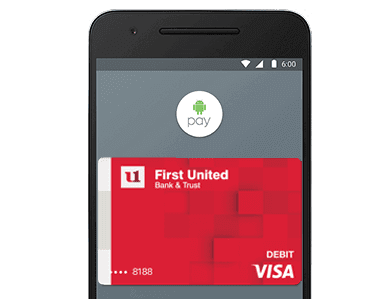 You can also use Android Pay to make in-app purchases. Hover your compatible Samsung phone above the checkout reader and authorize with your fingerprint to make in-store purchases. Business Owners: Are you looking to accept mobile payments? 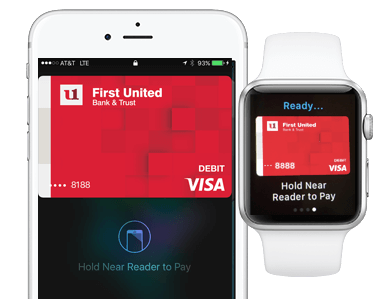 Our First United Treasury Management specialists can help you accept contactless payments, such as Apple Pay, Android Pay and Samsung Pay. We can also help you with other payment technologies like EMV chip card terminals and tablet or mobile options. Contact us for more information about these payment solutions for your business. 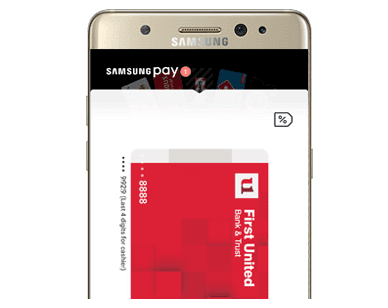 Mobile payments like Apple Pay, Samsung Pay and Android Pay convert your debit card into a digital token. This allows merchants to accept in-store and online payments and transactions to be initiated with mobile devices via that token through a contactless payment or NFC technology. Depending on several factors, certain cardholders may receive this message during enrollment. This is a risk mitigation process that requires additional authentication. The consumers that are redirected must manually confirm their identities before their card can be added to the service. Cardholder identity will be verified against cardholder information stored on the payment platform. Once identify is confirmed, the service will be activated. The number for this verification process is 1-844-590-5256. Please note: This number may be noted on your device or app in reference to verification of your card, such as 'Contact First United Bank & Trust' or 'Call your bank'. What are some possible authentication questions I may be asked? As the cardholder, you may be asked for the last transaction made with the card they are trying to set up, along with the purchase amount and either the date or merchant name. Additionally, you may be asked for the last four (4) digits of your social security number, date of birth, mother’s maiden name, home telephone number, expiration date of your card and/or zipcode. You are able to call back and verify your information at a later date if you are unsure of information for an answer. When I use Apple Pay, Samsung Pay or Android Pay, does it use my debit card (PAN) information? Will I continue to earn rewards and benefits from my credit or debit cards when I pay? Yes. When using this service, you will continue to receive applicable My Bank Rewards points that your debit card provides. You can use Samsung Pay in eliglbe stores, often where you see contactless terminals. To make a payment, place the back of your device on the card or NFC reader on the payment terminal. The Galaxy Gear S2 (with NFC only) & Gear S3 watches may also be used for payments. For more Samsung FAQs: Click Here. Message and data rates may apply; contact your cellular provider for information on your mobile contract. Call us at 1-888-692-2654 if you are experiencing any issues. iPhone® is a trademark of Apple Inc., registered in the U.S. and other countries. App StoreSM is a service mark of Apple Inc. Android™ is a trademark of Google Inc.